Iconic symbol of the Pacific Northwest. 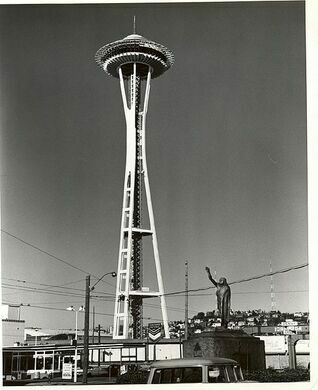 Built in 1962 for the World Expo, Seattle’s Space Needle is recognized around the world because of its distinctive structure, which allows for it to rise more than 600 feet above the Seattle Center. 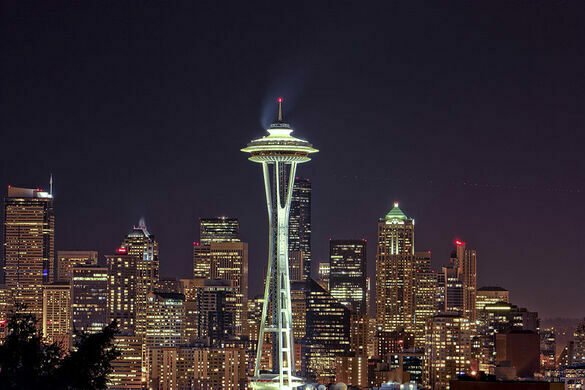 For the past 50 years, the Space Needle has been the most famous landmark of the city in the Pacific Northwest, drawing immediate associations with Seattle whenever and wherever it’s seen. Nothing else dares compete with the Needle. A brewery warehouse which doubles as a circus bigtop. A 50-year old dive bar that has its own yacht club. Part of what makes the Needle so distinctive is how skinny it is. Though it stands more than 600 feet tall, it’s only 138 feet wide at its widest point. The structure weighs more than 9,500 tons. When it was completed it was the tallest structure anywhere west of the Mississippi River and was celebrated because it could withstand winds up to 200 miles per hour and 9.1-magnitude earthquakes. Twenty-five lightning rods on the top of the Space Needle prevent lightning damage. From the top of the Space Needle, visitors can take in 360-degree views of the city skyline, Mount Rainier, the Olympic and Cascade mountains, Mount Baker (on a clear day), and Elliot Bay and the surrounding islands. 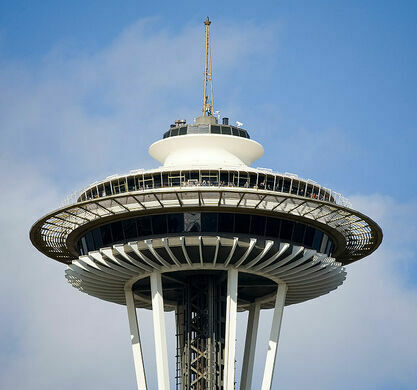 A rotating restaurant on the top of the Needle is just one of several attractions, which also include a gift shop on the ground floor, an observation deck, and more. 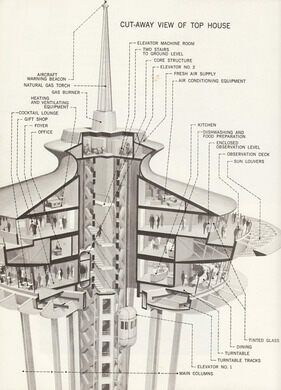 During the World Expo, it’s estimated that about 20,000 people used the elevators in the Space Needle every day. While the traffic has since dropped dramatically, the Needle still sees plenty of feet. 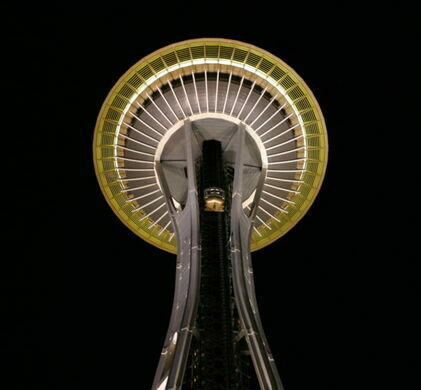 Not too long ago, the Space Needle received its first cleaning in 46 years, when in 2008 German-based cleaning company Karcher—monument cleaning specialists—scaled the Needle with ropes and power-washed the whole thing. 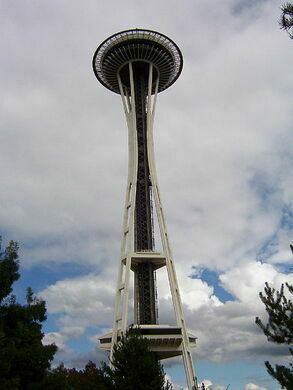 Visitors can reach the top of the Space Needle in only 43 seconds thanks to elevators that move at 10 miles per hour. But despite the quick climb, it can still take a while to reach the top because of hour-long lines that often wind around the base of the tower. 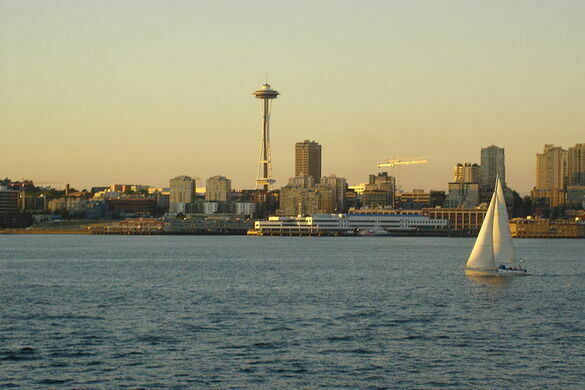 The Space Needle was designated a historic landmark on April 19, 1999, by Seattle’s Landmarks Preservation Board.